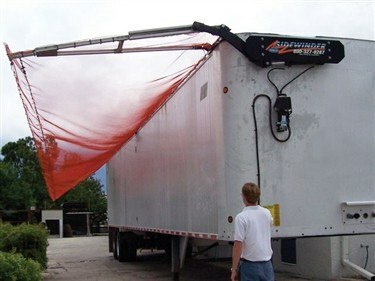 At only 350 lbs, the Sidewinder 350, Transfer Trailer Tarp System meets weight requirements without sacrificing durability! The Sidewinder 350’s modular and interchangeable components fit either side of the trailer and do an excellent job of sealing the load. The system is fully automatic, covering and uncovering the load in under 20 seconds, while the operator stays safely on the ground. Aluminum I-beam construction provides unsurpassed strength without unnecessary weight while twin cable design eliminates support ladders and bars. The Sidewinder™ 350 fits all front wall styles and rests flush against trailers, flexing during loading and unloading to accommodate stresses. 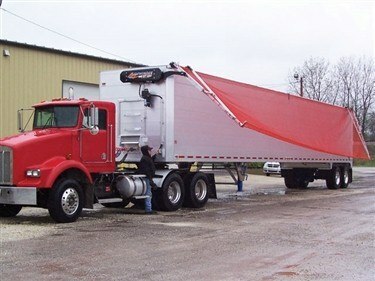 The unique light-weight two-arm design (one forward and one rear) lets the tarp conform to heaped loads and still seal on all sides, avoiding loaders and areas where loads are typically highest. Head assembly comes preassembled – no welding is needed!